So far, we only have a few paintings of Italy. It doesn’t surprise me that they feature water. When I think of Italy, I think of Rome, glorious fountains and the beautiful waterways of Venice. On The Famous Artists, the paintings of Italy reflect two different centuries. You can almost tell which is the older painting, simply by observing it’s more muted colors and darker tones. 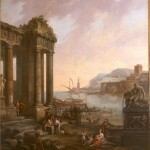 Antonio Zucchi was an Italian neoclassical painter and his painting of an Italian seaport clearly shows the painting style of the 18th Century. 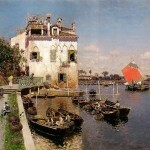 A Spanish painter, Martin Rico Ortega shows us a glimpse of life as a fisherman in 19th Century Venice.